The most popular queen bed room with stunning tiled bath, porch, bright and sunny with Twin Peak views. $130 per night. A romantic favorite with amazing views from your queen bed. 2 baths, porch, the largest double occupancy room. $140 per night. Sleeps 6 with 2 extra long double beds and queen fouton. Lots of windows for direct lake views. The largest room. $150 per night. Experience the peaceful, quiet of scenic Twin Lakes Village, Colorado. You decide whether it's a fly rod, lake canoe, mountain biking, hiking, or just a lazy walk around the 130 year old dirt streets of this historic mountain village. Hike or bike unlimited ancient Ute Indian trails to historical mines, hotels, and hidden high mountain lakes and beaver ponds. Photograph elk and summer snow capped peaks. Plan a drive over Independence Pass to Aspen only 35 miles away. Enjoy lunch at one of the local diners, or dine in with one of our Roadhouse dinner specials. Take a scenic drive to Leadville or Buena Vista. This year, you can also browse our new art gallery, in the lobby, featuring artist-in-residence, Constance Erickson. 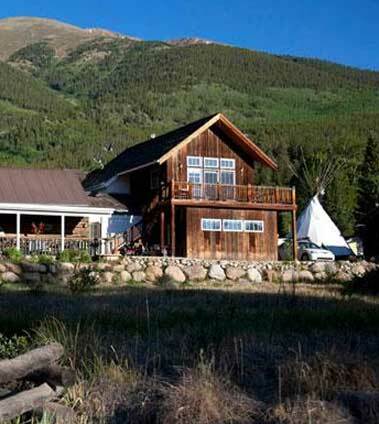 We are the only AAA approved lodging in Twin Lakes and just 35 miles over Independence Pass to world famous Aspen. Colorado’s largest glacial lakes are across the street of the Roadhouse Lodge. Great fishing,boating, views,and, hiking. A continental Breakfast is served every morning and features our famous homemade cinnamon rolls. Sit on our deck and enjoy the views!